The rector is available for Celebration of Life or Memorial Services and Columbarium or Grave Side Services. We do not have a cemetery, but we have a Columbarium in our Memorial Garden at Christ Church. 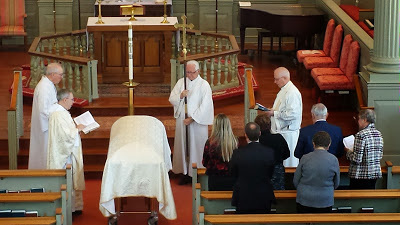 Funeral Receptions are provided for members by the parish to provide family members an opportunity to greet relatives and friends and have refreshments after the service. Caring members of the parish make and serve tea sandwiches, baked cookies or sweet breads. A columbarium is a place for the respectful and usually public storage of cinerary urns (i.e. an urn holding a deceased cremains). The term comes from the Latin columba meaning dove. It offers an opportunity to reclaim the churchyard burial tradition by providing a final earthly resting place. Please contact Kathy Garber, Parish Administrator, to make arrangements. 330-650-4359 or Kathy.garber@christchurchhudson.org.